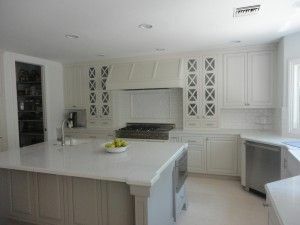 8 Steps to a Perfect Kitchen Design - by I&E Cabinets, Inc. When you are in the first steps of making the plunge into a kitchen design remodel project you may be shy of calling in a professional too early. We understand. If you are wanting to come to the initial meeting with a solid plan so you can get a very good estimate then this article is for you. The way to get an exact kitchen remodel estimate is to have a solid plan based on your kitchen’s dimensions and your personal tastes. Before you get into types of doors and colors it is really important to decide what things you want in your kitchen. When remodeling you get the chance to fix all those things that have nagged you. Your kitchen design first needs to incorporate all the kitchen appliances you want. Stove top, or in the wall double oven or a Chef’s wide stove? Do it with cutouts that are scaled to match on paper or in kitchen design software on you computer. Change anything you need to in the kitchen design! If that stove is too big for your kitchen, then look at alternatives. If the new wine cooler would look nicer if it was larger then change it! 5. After your appliances are all set, then take a look at the spaces left. What would make your life easier in those spaces? Don’t be jockeyed while you cook. If you have someone else wandering around in your kitchen plan for it. Do you like pull out cabinets with built in organizers for specific goods? Do you like lazy susans? Use the space you have! What about an island? What about a cook book shelf? This is a good time to head on over to Houzz and get inspired! Use every inch. No unusable spaces need to be accepted! 6. Now think about Style! Do you want traditional, contemporary, glass, or a combination of door styles? Do you want everything in the kitchen to match? Right now “everyone” is doing a different island! What kind of countertops do you want? Silestone, Cesarstone, Granite? New Floor??! Wood, travertine, tile? 7. Think Color and Light! Put it all in the kitchen design software and see how it looks. Change it until you love it! With all the planning you have done you will get an accurate quote!